There’s been a lot of talk in the media and on the Internet over the past few months about food storage. And while there’s been a lot of talk, how many people do you think have actually taken it seriously enough to make a plan and then act on it? Starting from scratch is a daunting task, and I wouldn’t blame anyone for putting it off until next week or the week after that…etc. The fact is though, that the sooner you get started, the better off you’ll be. Food storage is a lot like investing. Actually, food storage is investing. Starting early, keeping steady, and taking it one step at a time will pay huge dividends in the future. Seeing the good sense in food storage is easier today than it has ever been. I’m not just trying to be pessimistic or a fear monger—it’s good practice to take an inventory of current events and prepare ourselves to more easily navigate the turbulent waters that lay ahead (or that we’re currently sailing through). Already this year, freezing storms have pounded much of the U.S. causing accidents, closing roads, and leaving millions without power. In the Storm of the Century (’93) and the Blizzard of 96, cities were completely shut down for days. You may have some good food in your refrigerator or pantry. But once that food is gone, where will you find more? Even if you are able to make it to the store, they may not be open until the power is back on and the employees can also make it across the roads to work. In addition, the supply trucks are likewise subject to the wrath of storms and may be stuck on the side of the road for days or more. Before long, the shelves could be empty and the local grocery store will not be able to act as our emergency food supply. Disruption of the food supply can take many forms—from the disaster or storm-type situation described above to personal illness, job loss, or other circumstances that can make it more difficult to put the food we’re accustomed to on the table. Food storage is like a savings plan that will help mitigate those threats. In addition to our own needs, we may be called on to help family, friends, and neighbors. Despite the unfriendly world we live in, I doubt I know anybody who would let and elderly widow next-door go hungry while enjoying a warm meal a door or two away. It’s also possible (even likely during the holidays) that we have friends or family over when a storm or other event strands others in our care. In these cases, having the bare minimum in the kitchen shelves won’t cut it. Not only is it an investment in your own safety and peace of mind, but if done correctly, can translate into real dollars. Food prices rarely go down. When you buy now for potential rough times ahead, you cut out inflation and price gouging, and you’ll inevitably enjoy a better selection than you would get if forced to buy when there’s a run on the supermarket shelves. There are about as many ways to do food storage as there are foods to store. Some of those methods include canning, bulk purchasing, MREs, freeze-dried and dehydrated foods, rotation systems, and even hunting (storing ammunition, anyway). In the future, we’ll go over pros and cons of each of these avenues. Humans can live a few weeks without food, but only a few days without water, so be sure to include adequate water storage in your plan. Again, we’ll cover this in-depth (no pun intended) in a later post, but for now one of the most helpful water storage resources we’ve ever seen can be downloaded here: Water Storage & Purification. Ready.gov Food Storage Ideas: Extremely basic…but what do you expect, it’s the gov’t. Find out how long will your food will last: A great resource for telling how long your foodstuffs will stay good. StockUpFood.com: A free way to track and calculate your food storage needs. If you haven’t started preparing your food storage, now’s a better time than ever. 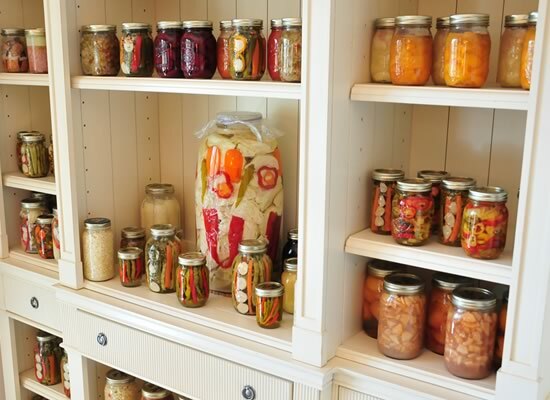 A good food storage is the foundation of any strong bug out or dig-in plan. Police Scanners – Online and Traditional to become a thing of the past? It doesn't take much to keep BugOutBlog going, but every little bit helps. If you can spare $1, you'll be a big help to bringing more Practical Preparedness to a wider audience. Thank you!